Allied was one of those films that I named, I haven't seen when I posted my post about The Best Films Of 2016. It finally got released in India, and with mixed reviews from critics and audience, I went in expecting a good film, if not great. And, I exactly got what I thought after watching the trailer. Allied is not a great film and neither it's an awfully bad film, it is a good film, with some flaws that's it. Robert Zemeckis is a director whose work I have not exactly loved, but Back To The Future are great and by far his best. It is the only one I love from Zemeckis. He has also created, which I think is the most overrated film like ever, Forrest Gump. His last year's The Walk was somehow not a great film, but his Contact is also which I liked. So, this all being said, I didn't exactly thought that I would like Allied, but in some way or the other I did. Performances: Brad Pitt is amazing in the film, he gives not one of his bests in this one, but he still rocked the role of Max Vatan. Marion Cotillard, arguably the finest actress working today, she gave a brilliant performance as she gives most of the time. 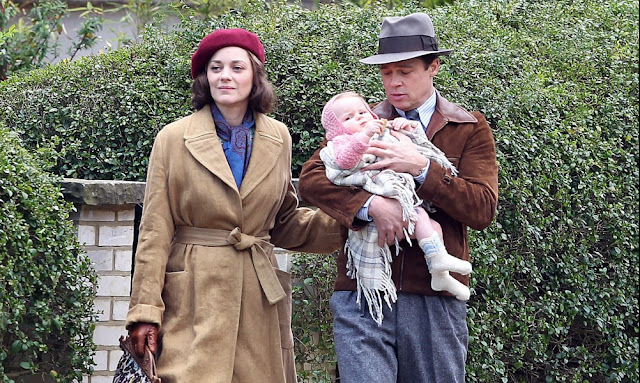 Other's don't have much role in it, this film is mainly consists about these two, and the chemistry between Pitt and Cotillard was pretty good. What is the part of the film, that I didn't liked? The action, it is done in pretty unrealistic way, they could have gone more safer way to do them. And that might be a major issue with the film, other then that, it is fairly enjoyable. I cannot say, that I didn't had a good time with it. It is a popcorn sort of flick, but a good one of the lot. It had a very noir-essence to it, and it certainly had more potential to be a great film, but the end product that matters. So, I would suggest Allied. Not awful, not great. NOTE: This film wouldn't make my list of best films of the year 2016, but certainly would have been in the honourable mentions. So, what rating would you give to Allied?